The latest cancer therapy coverage parity bill is our best chance yet for success. When a patient is diagnosed with cancer, the physical and emotional aspects of treatment make life difficult. Many patients are surprised to find their insurance may not cover all their treatment options equally, adding more stress to their situation. While the copay for an intravenous (IV) cancer treatment can be as little as $100 a month, insurers may charge patients thousands for a medication that comes in pill form. More than 91 million Americans remain exposed to this glaring flaw in their health insurance plans. 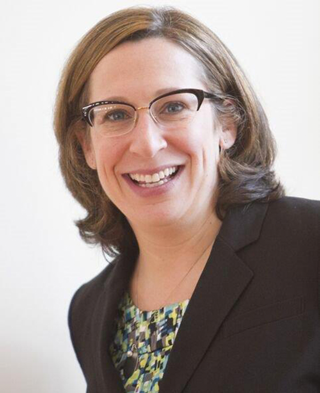 ROBIN LEVY FROM THE INTERNATIONAL MYELOMA FOUNDATION BELIEVES THAT THE LATEST VERSION OF FEDERAL ORAL PARITY LEGISLATION HAS THE BEST CHANCE YET OF PASSING CONGRESS THAN PREVIOUS VERSIONS. This insurance design is no way for us to treat patients with cancer such as multiple myeloma. That’s why, during this year’s Multiple Myeloma Action Month in March, the International Myeloma Foundation (IMF) has launched the Coalition to Improve Access to Cancer Care to advocate for common sense state and federal oral parity policies that will protect patients with multiple myeloma and other cancers from unequal coverage. The IMF has been working hard for the past decade to get state and federal oral parity bills passed. In my role as senior director of public policy and advocacy at the IMF, I have seen firsthand the progress that has been made in multiple myeloma treatment, including the addition of oral therapies. 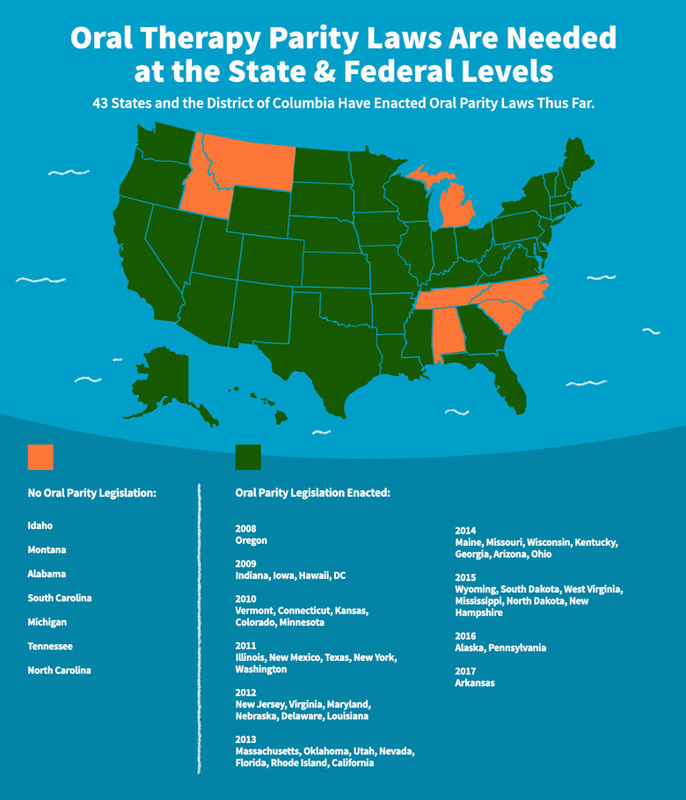 So far, oral parity laws have been passed in 43 states and the District of Columbia, and they are working. In states that have enacted parity legislation, the proportion of prescriptions filled with $0 copays for oral cancer therapies has surged from 15 percent to 53 percent, according to a recent study. With the high cost-sharing penalties for those treatments eliminated, the use of oral anti-cancer medications has increased by 22 percent. The same study also found that state oral parity laws did not lower costs for all patients. About 61 percent of Americans have health insurance that is funded by their employer and, therefore, is not governed by these state laws, which regulate only individual and small business plans.3 The only way to protect all patients with multiple myeloma and other cancers is through federal legislation. If there is one thing that everyone in Congress can agree upon, it is getting patients with cancer affordable access to the most appropriate care possible. Last year, the Cancer Drug Parity Act was introduced in Congress. With bipartisan support from 140 cosponsors equally divided between Republicans and Democrats, this bill represents, in my opinion, our best chance yet to get federal oral parity legislation passed. If there is one thing that everyone in Congress can agree upon, it is getting patients with cancer affordable access to the most appropriate care possible. Despite this progress, some myths persist around oral parity. For instance, some critics argue that covering oral medications at the same level as IV therapy will increase the cost of healthcare and insurance premiums, but the truth is that oral parity laws have not significantly increased either. In a recent study, researchers found that parity laws have not led to any additional costs for insurers at all. Meanwhile, other people falsely assume that there is always an IV equivalent to oral medications. But in reality, some patients have no other option than the oral medication that their doctor has prescribed. While we have a good deal of momentum on the latest federal oral parity bill, we cannot let up yet. We need the House Energy and Commerce committee to schedule a hearing and move this bill out of committee. Our advocacy staff is frequently on Capitol Hill, but we need patients to take action as well. We need patients with multiple myeloma, survivors and their loved ones to help members of Congress understand why we need this bill. We need the multiple myeloma community to share their personal stories. We need more letters to the editor highlighting the need for oral parity legislation. These small actions can make a significant difference in getting Congress to act in the best interest of patients. As medical innovation continues to pursue a goal to a cure for multiple myeloma, what good is a cure if patients do not have affordable access to it? And what good is insurance that does not protect patients with multiple myeloma from the cost of their treatment? Congress should pass the Cancer Drug Parity Act, and it’s our job as advocates for the multiple myeloma community to explain how this can help our community. To learn how you can advocate for oral parity legislation, visit the Coalition for Equal Cancer Access website.